I met Julia about ten years ago when I was an assistant stylist on a photo shoot and we just clicked, it’s that simple. I love her relaxed way and we have remained friends ever since. 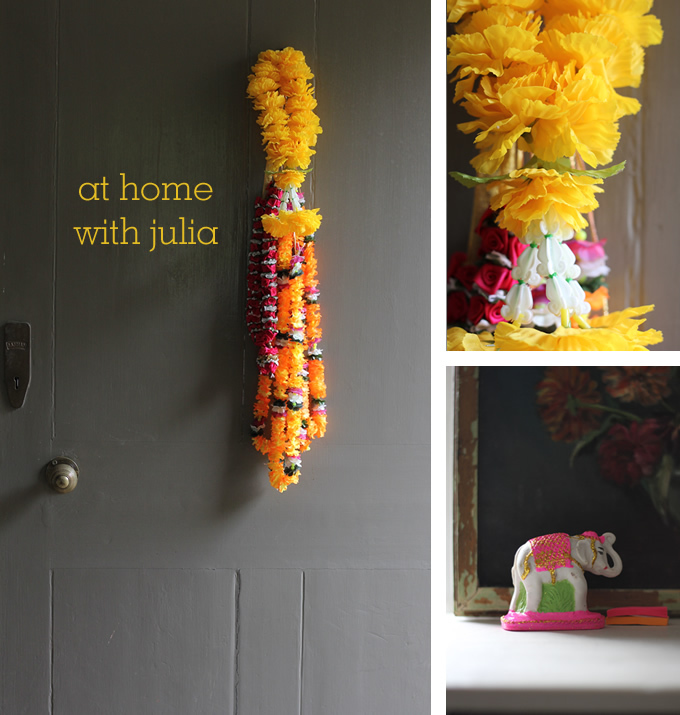 When I started working as a stylist in my own right Julia and I shot together and I’ve also made props for her. 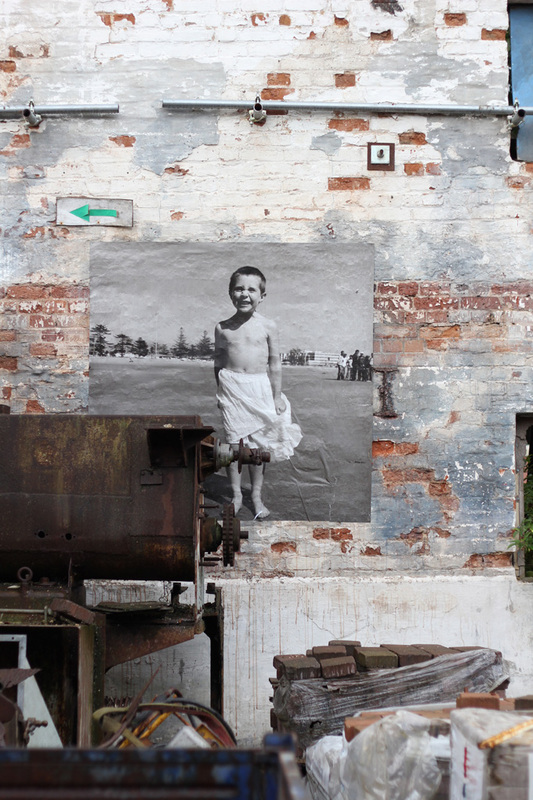 There are some images in my portfolio of our work, and hopefully there will be more soon. Julia is a fantastic photographer specialising in photographing children, mainly fashion and interiors, for commercial and editorial and has worked for companies including Monsoon, Marie Chantal, Jigsaw Kids, Caramel and Harrods and magazines including Vogue Bambini, Milk, Junior, Marie Claire and Red amongst others. 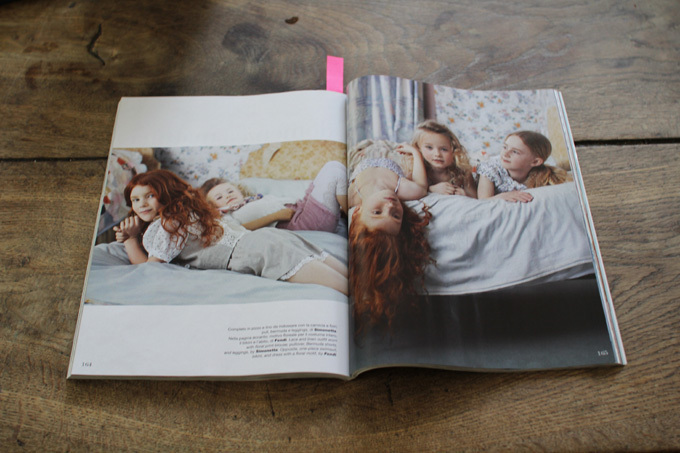 Her kind, relaxed and fun way of working means her shoots are too and I think it shows in the children’s faces. Last weekend we went to stay with her and her family in their new house in Suffolk with her two girls, husband Ben and Poppy the sheep dog and they have started decorating and remodelling. 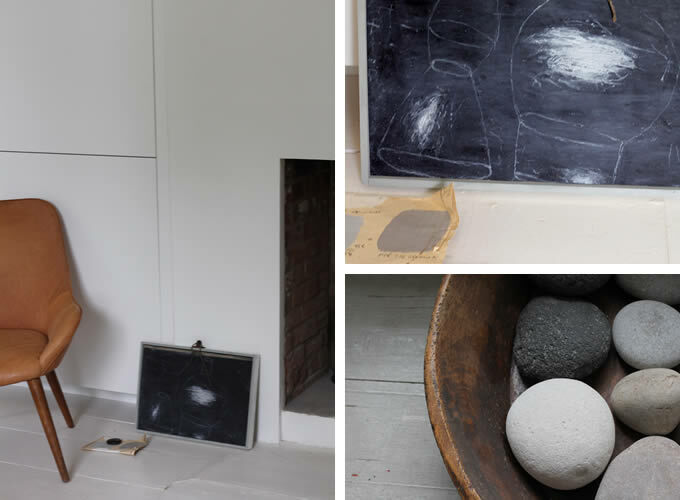 Julia and Ben have great style and I couldn’t help but ask if I could take a few quick snaps of their lovely home. Just a little snippet. I can’t wait to see how it progresses. Top photo – Good luck charms: a silk flower garland hangs on the back door. This painting is by Sue Skeen and from the Kettle’s Yard Found sale. Below is Julia’s favourite photo which was a gift from her husband Ben and is by the renowned photographer Mario Giacomelli. There is currently an exhibition of his landscape work running now until 30th July at Ben’s gallery, Atlas, at 49 Dorset Street, London W1. The little collected shells in the bottom left corner were threaded on a stick with a sweet little message from the girls for their dad. 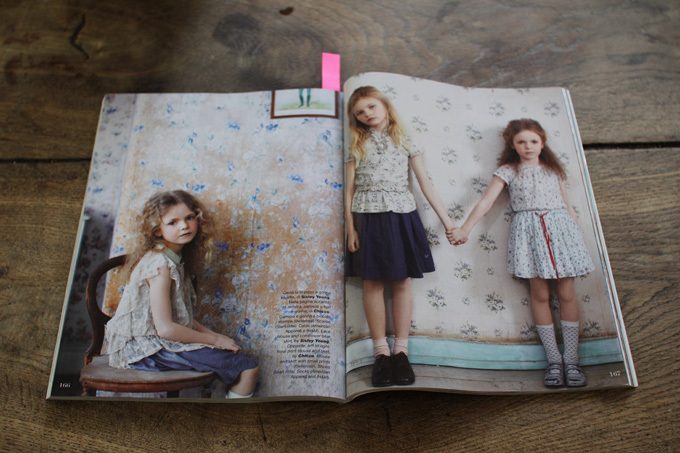 Julia’s story in the May/June issue of Vogue Bambini is just amazing and I love it. She has a story in the new July issue too which I can’t wait to see. You can see more of Julia’s work on her personal website here and also on the One Photographic website. If you have 5 minutes, have a look, her work is beautiful. 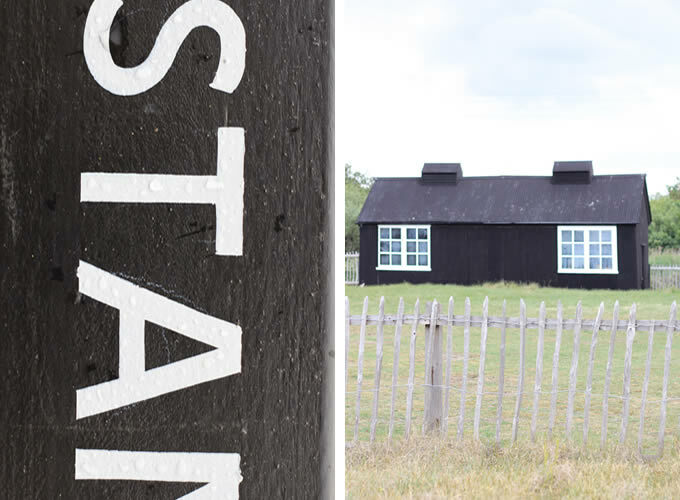 Last weekend we fled London to visit friends in Suffolk. It’s a lovely part of the country, beautiful coastline and countryside and lots of arts, crafts and antique shops to browse whilst eating fish and chips and ice cream by the seaside. 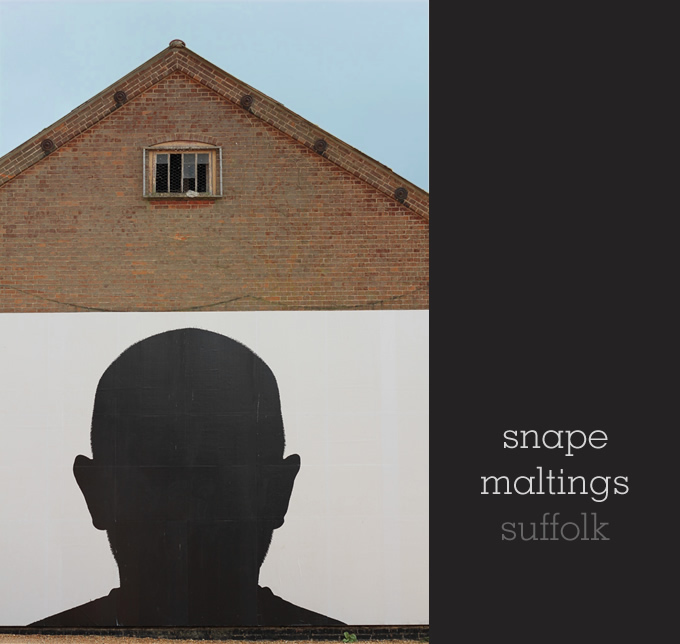 While we were there we went to Snape Maltings in Saxmundham where our friend Ben has an inspiring new photography gallery. 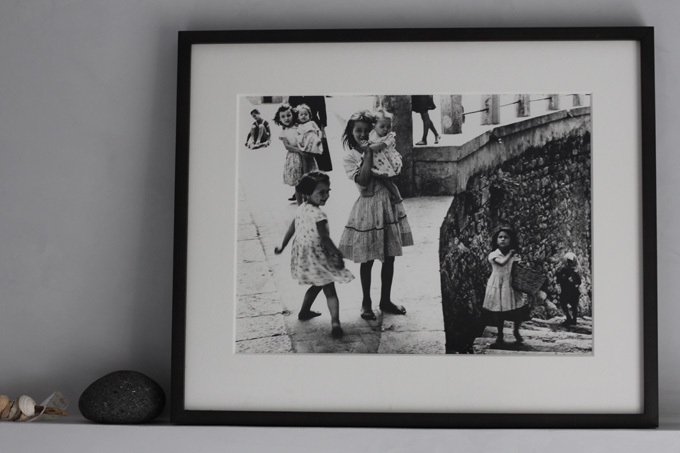 If you like fine art photography take a look at the Atlas Gallery website, Ben’s London and Snape galleries show a who’s who of influential photographers. 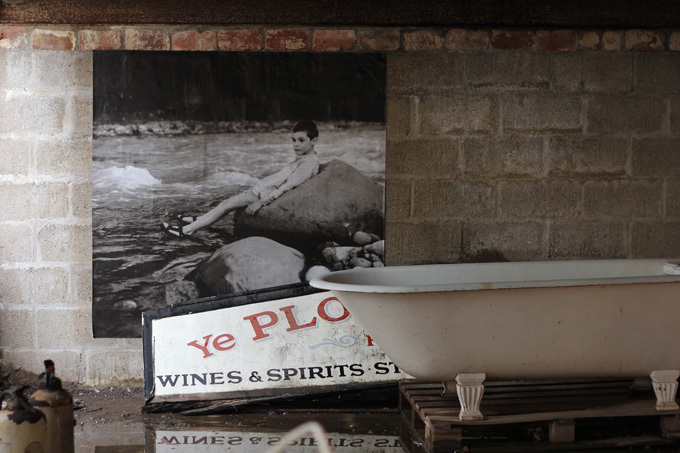 The Maltings is a great place to visit – art, culture, history, food and and a bit of shopping all in the amazing surroundings of (mostly) restored 19th century warehouses by the river and surrounded by stunning scenery. 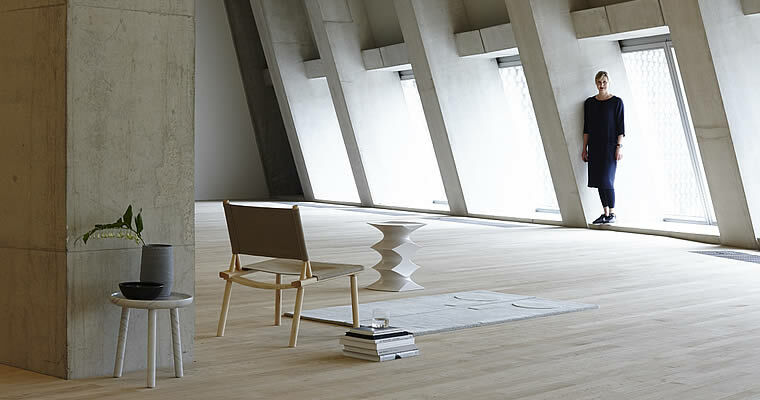 There is a music performance hall, lots of art exhibitions and sculptures by artists including Barbara Hepworth and Gary Hume. Have a look at their website for more info. 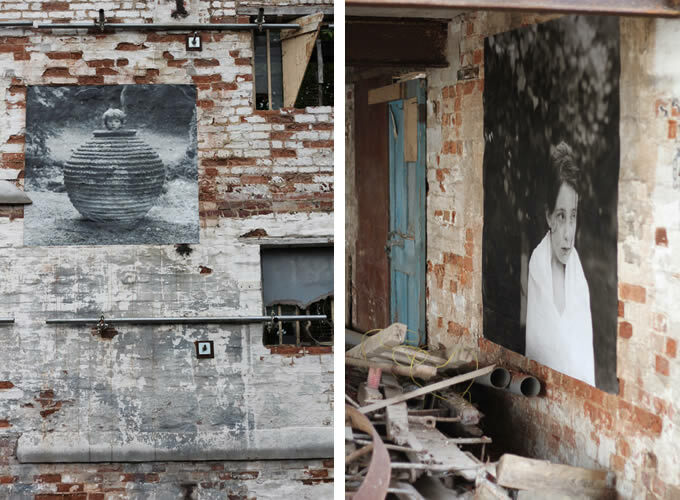 They currently have lots of exhibitions running as part of SNAP Art at the Aldeburgh Festival which is on until the 26th June. The giant silhouette on the wall above is by Simon Liddiment and I particularly liked the Johnnie Shand Kydd exhibition. 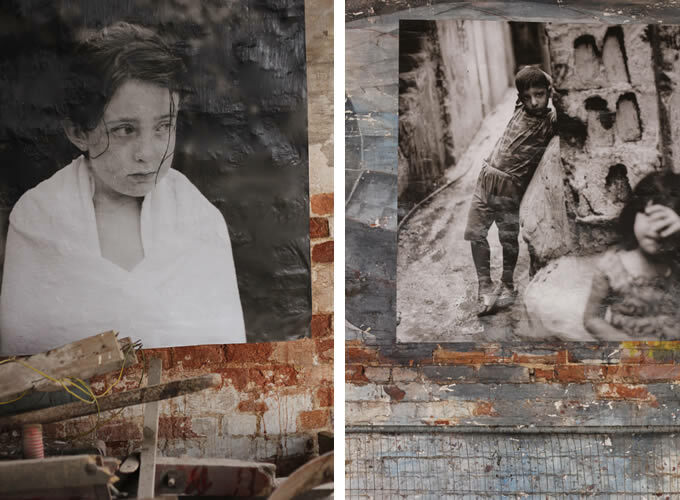 I couldn’t help but take photos of the huge black and white prints wallpapered to the crumbling walls of a roofless, four story high, junk-filled warehouse that has been left in its state of disrepair. It was stunning. This is only on until Sunday so don’t miss out if you are anywhere close by. 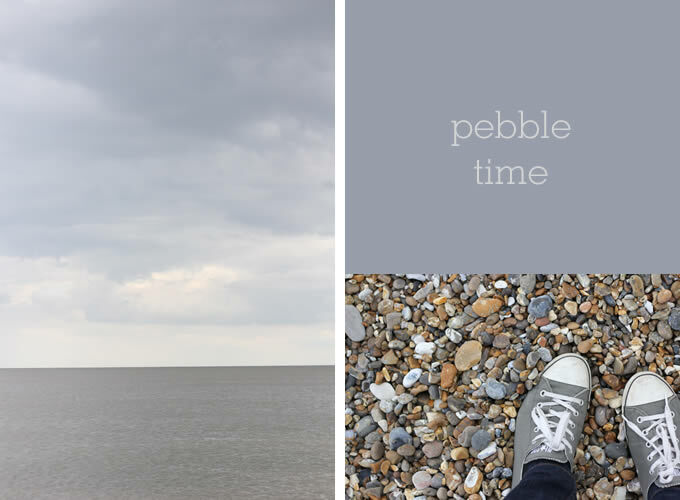 Aldeburgh town is on the seaside close by and is lovely too with the most delicious ice cream shop and a great beach for pebble collecting! Have you been? I can’t wait to go back! 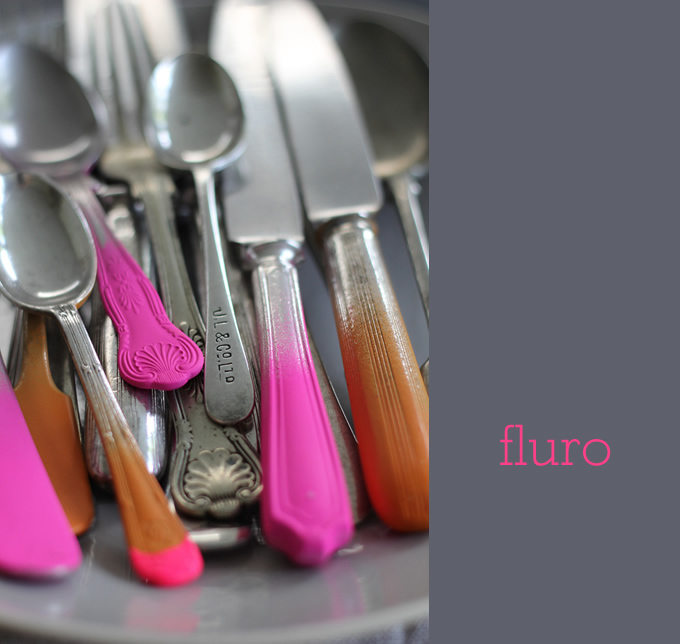 I feel the need for some colour at the moment so my vintage cutlery received the fluro treatment! There is a bit of a trend for painted and coloured cutlery I’ve been noticing and I have taken it in my own way by simply spray painting some of the handles. I picked up this old silver-plated cutlery at my local car boot sale for 50 pence each which is such a bargain. I love the fact it is all mismatched designs and styles, it gives it character and makes things more interesting. I gave them all a good clean and then took them into the garden, put down some newspaper and blasted the handles with the bright pink and orange spray paint I had in my paint collection. This spray paint will scratch off but I don’t mind, the patina will add character. 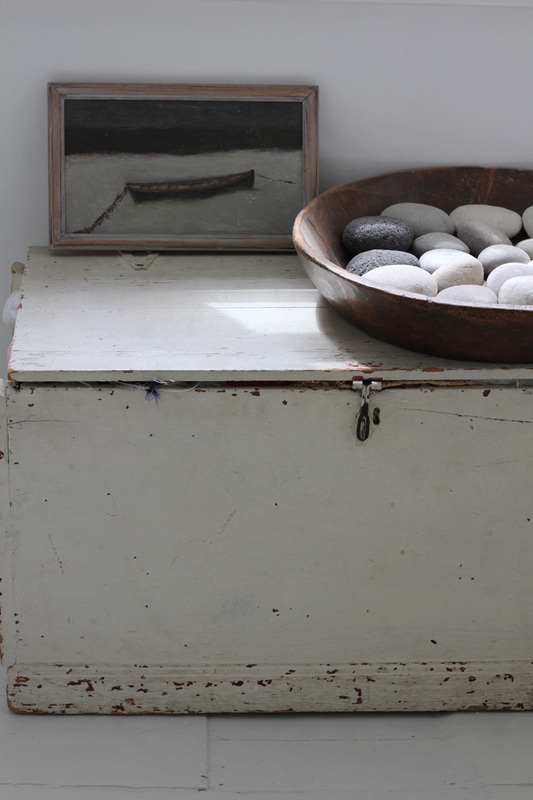 To reduce scratching I would use enamel paint or even just dip the handles into pots of different coloured paint. Or I can scrub it off and repaint them another colour, perhaps to match the theme of a table setting in a shoot. Just a frivolous bit of fluro fun! Update: It seems this picture has popped up around the web without me knowing, much to my surprise, especially on Pinterest. So just to elaborate on my comments below, I didn’t do this to my everyday cutlery that we eat with, this is old cutlery that I use as props for photos. Plasti-kote say that their Fast Dry Enamel , which comes in lots of colours, is completely non-toxic when dry and contains no ingredients that would be harmful to children or pets – but solvent-based spray paint can be harmful if ingested and you should always check the smallprint on any paint you use, follow the maker’s instructions and use common sense. If in doubt ask an expert at your local paint store. I think I may get my love of collecting and keeping little things from my Grandmother. She has always been a magpie. She is elderly now so her wings have been clipped, but she always kept everything. And I mean everything. As children, whenever we were at her house and asked for something then she had it. Somewhere, from a draw or a cupboard or a box on a shelf, she would pull out what we needed. Last year, when my mother and I were at her apartment helping organise things, we discovered a whole wealth of treasures squirrelled away; beautiful vintage tins, my mother’s baby clothes, embroidered table linen, amidst other saved items like old egg boxes and tinfoil sweet wrappers all flattened in a pile. 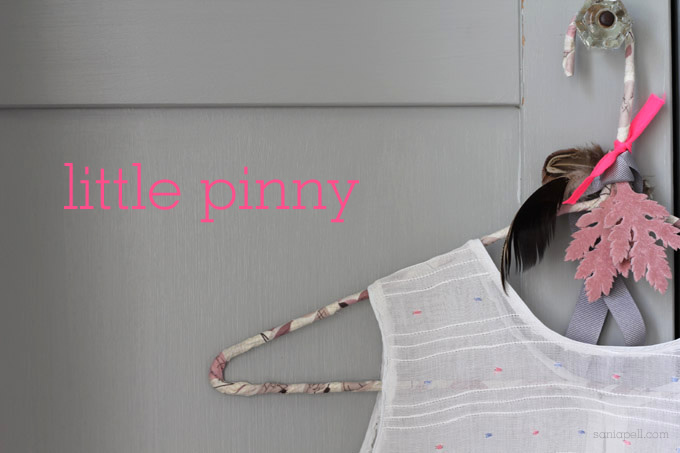 Amongst the items was this lovely little pinny. It was my mother’s when she was about three or four, a similar age to my daughter now. 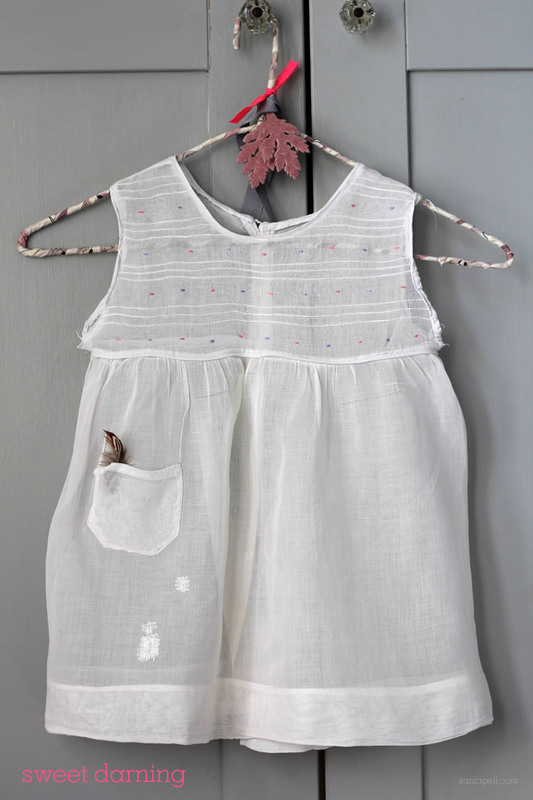 I love the detail in the simple dots and pleats and my Grandmother’s darning just adds to it. Little patches of history of that give it so much character. Like my grandmother, I love to collect and keep little things that I don’t have a purpose for. But I know that at some point I’ll have an idea for… or an occasion to use… those beautiful felted balls, that vintage ribbon or that old tape measure. It means that when I have an idea and want to get straight on with making, then I can usually rummage around and find something suitable to make it special, rather than write a shopping list and lose the momentum of the idea. The clothes hanger in the photo is one that I made using scraps of fabric that I already had. It is a project from The Homemade Home with step-by-step instructions if you want to try it at home. It now hangs in my daughter’s bedroom to be enjoyed by a fourth generation of little girl. Something to make me remember my family history and smile. To me, this kind of family treasure is priceless. Although I have worked with lots of amazing photographers, I think this may be the first time I’ve seen one of my own photos in print! 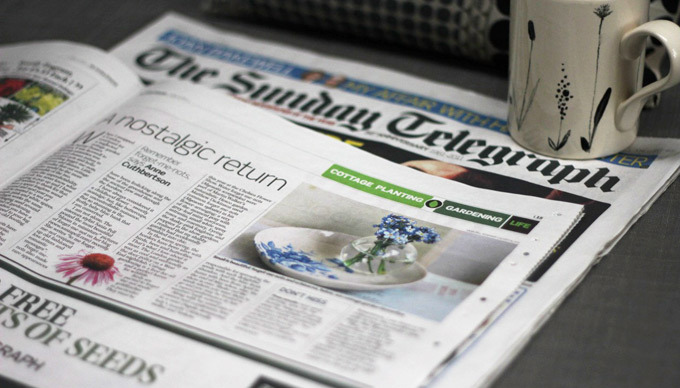 I was very flattered when The Sunday Telegraph contacted me to ask if they could use one of the photos from my recent Forget-me-not post. “The forget-me-nots have been the biggest surprise [in her garden]. They were nowhere to be found when I moved in, but this spring, tiny blue flowers have been frolicking along the base of the greenhouse and the ancient yew and through the borders. I have always considered it a childhood flower – sweetly nostalgic but, like buttercups. an uncontrollable nuisance. But so stunning is the frothy baby-blue bank that I am converted. “I am not alone. 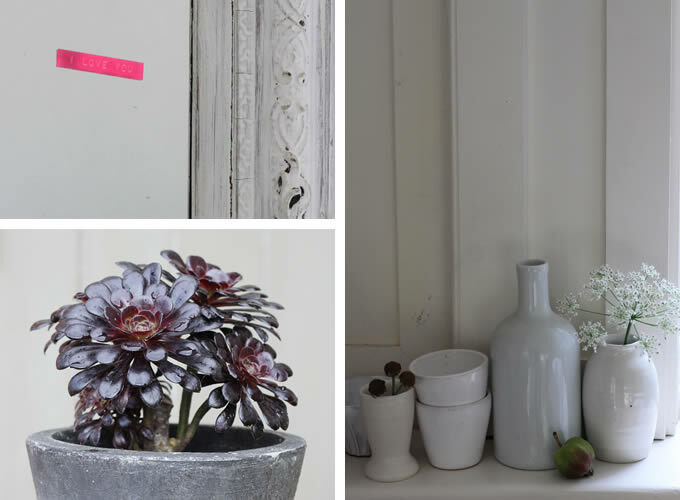 The interiors stylist Sania Pell posted the most beautiful “bloom in miniature” pictures of forget-me-nots on her blog (www.saniapell.com) recently. 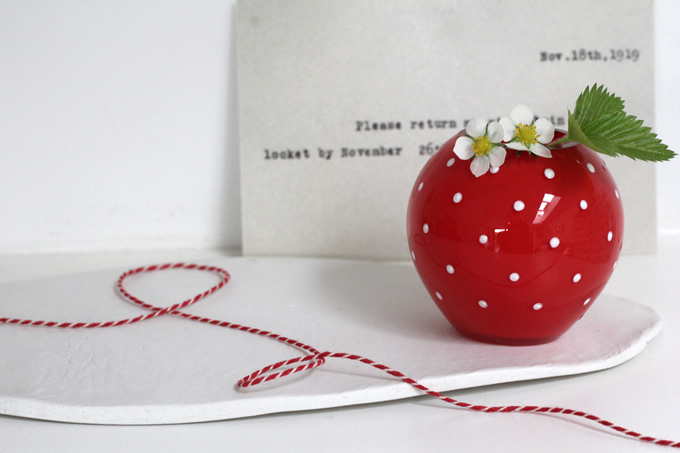 She writes “to me forget-me-not conjures up old-fashioned love letters and romantic messages”. Big thank yous to Anne for mentioning me in her lovely article and also to Rona from Flowerona for pointing her in my direction. To read my original Forget-me-not post click here. P.S. The graphic floral mug in the photo is one that I hand painted at a ceramics cafe a few years ago. I seem to be obsessed with miniature plants and flowers at the moment and I photographed these little wild strawberries that I’ve been growing in my garden. Like my Forget-me-nots, these mini strawberry plants also came from my parents’ garden a few years ago. They grow happily everywhere, little off shoots creeping onto other bits of soil, the runners creating new plants where ever they touch. 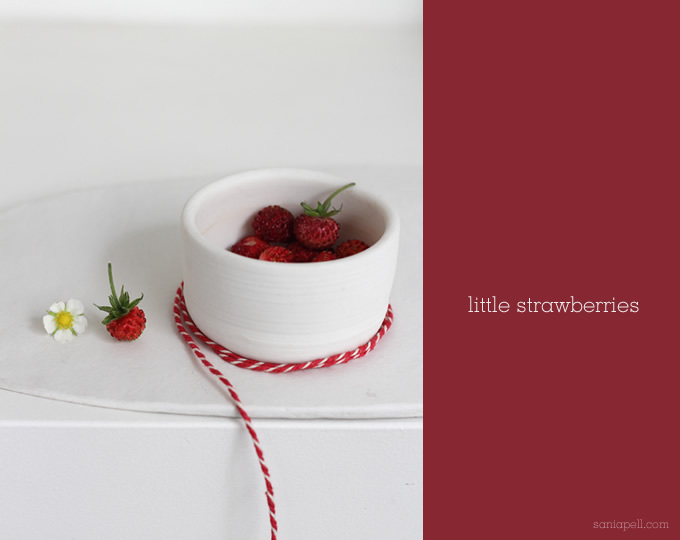 My children love the little plants and tiny flowers and watch them closely from when they begin to flower in April and change from charming little flowers to these sweet little strawberries by May and June. They watch and learn about plants, without realising, and then harvest the tiny crop, eating them straight from the plant. When the children were really small they used to run out into the garden every morning and see if any had ripened overnight and nibble them up before the snails got to them. They are still intrigued by the mininess, the novelty of such a small version to the larger ones everybody knows. This little vintage vase was given to me by my mother and is an absolute favourite of mine, I love the way it mimicks a little strawberry, it has a certain charm but also a graphic quality. The wonky plate it’s sitting on is one that I made by rolling out a handful of white, air-drying Das clay on a chopping board and then cutting the shape out with a sharp knife. I left it to dry and then sanded down the edges with an emery board to a smooth finish. The typed card in the background was bought at a most wonderful book shop in Notting Hill, Lutyens & Rubinstein. The wild has been tamed in my tiny London garden with tiny strawberries loved by tiny children.